Original floral tiles grace the restaurant’s entry. One of San Clemente’s oldest buildings sits on the corner of Avenida Del Mar and No. El Camino Real, fronting three-quarters of the block. Once home to town founder Ole Hanson’s real estate office, this structure, over time, has housed a variety of businesses with the largest portion being devoted to three different restaurants – Travaglini’s, the Travel Inn and the Vintage. Today the Gordon James Grill, a 21st century fine dining bistro tied to the village past, occupies that space, and this establishment is a “dream come true” for its owners. Like the story of any dream, it is a series of contributing events that make it a reality and the tale leading up to the opening of this eatery is no exception. The saga begins in the early 1970s, with a strong Arizona connection. At that time a young man named Gordon Rose was managing an upscale seafood restaurant in the city of Tucson. A young woman named Anne Ailts, who had a boyfriend named Jim Niederhauser - manager of a restaurant in New York - was his hostess. Another young lady named Penny Starke was a senior at the University of Arizona and a frequent visitor to the restaurant. She eventually became an employee. These four people soon became fast friends. That friendship ultimately blossomed into two marriages, a continuing connection while each couple followed separate roads, and many years spent by both parties in the restaurant arena and on other occupational pursuits. And like many life journeys this one eventually came full circle, when the husband and wife quartet came together to combine their friendship, talent and business acumen to open an eatery they could call their own.Ancient fireplace warms the homey dining room. For 14 years before the opening of the Gordon James Grill two of the owners, Gordon and Penny Rose had lived in Laguna Niguel and visited San Clemente often. They soon fell in love with the village ambiance and knew they wanted to move to and have a business in the town. On a visit to the hamlet one-day in 2003, Penny noticed a “For Lease” sign in the then vacant Vintage Restaurant’s window. Ecstatic, she rushed home to tell her husband about her find. Their good friends Jim and Ann Neiderhauser, immediately came to mind as business partners. Although the building was dilapidated and rundown, the diverse backgrounds of the four friends enabled them to see its potential and to visualize the outcome … to “save old bones” and incorporate a new, contemporary look without losing the feel for the building’s heritage. The partner’s foresight and persistence paid off in spades, and after almost a year of hard work from lease to reconstruction, to restoration, the Gordon James Grill opened its doors on January 5, 2004. From exterior to interior, this bistro was designed and constructed to emanate and retain a part of the village history. Photos of the building, its former occupants and the town as it appeared in earlier days, adorn the walls of the indoor patio room. The entry floors host the original floral tiles installed in 1926 (the same as those found on the entry floors in Ole’s famous residence, the Casa Romantica). An old door (discovered lying fallow in the basement of the building) was reinstated in the foyer entrance and outfitted with a pebbled glass that welcomes guests with a twinkling reflection. 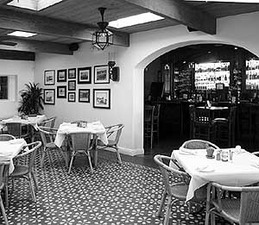 Chandeliers and lighted sconces (remnants from those earliest years) were refurbished and re-hung, casting mood enhancing lighting over diners, while an ancient fireplace remains standing in the Del Mar room emitting a warmth and comfort akin to someone’s living room. Located on El Camino Real, SC. 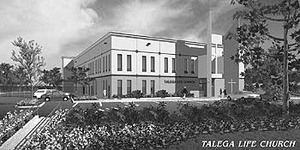 Although the name selected for this venture might seem the obvious choice – the first names of two of the principal partners – it was come by with much thought and trepidation. They did … and the talents and abilities of the foursome - Gordon and Jim’s many years’ restaurant experience; Penny’s design background; and Ann’s CPA skills - along with a hands-on willingness to work hard and to have one or more partners on the premises at all times, has resulted in a very successful first year in business. Many things set this restaurant apart. One is the white butcher-block paper stretched atop each tablecloth, accompanied by a holder of crayons. Originally installed as a means for occupying children until an order was served, this unusual palate has become fodder for the doodling of architects, artists, and business people, as well as the children. Another point of differentiation is Call Ahead Seating. When guests call in for a reservation and are told there is a lengthy wait they can be placed on a Call Ahead Waiting List, stay at home for the determined amount of time, and know when they arrive they will be seated withinOwners, Gordon, Penny, James and Anne behind their beautiful bar. approximately 15 minutes. It is, however, the ever- evolving American Contemporary menu of signature dishes: Fried Green Bean appetizers ensconced in a spiraled metal holder amid colored papyrus paper, a Hollywood Brown Derby Cobb salad, Ole’s Crab Melt sandwich, Rocket Angel Hair Pasta, a three pound sizzling Mississippi Catfish, and Osso Buco, always veal, that is the crème de la crème of the Gordon James Grill. These and the many other appetizers, salads, sandwiches, main courses, and daily meat and fish specials - the heads-together brainchildren of Rose, Neiderhauser and hometown chef de cuisine Joe Termini - provide guests with a fine dining experience that looks to be around for many years to come. It is interesting to note that this restaurant is housed in a building that was once the halfway destination for those traveling from Los Angeles to San Diego and back. Many travelers would gas up at the service station originally located on the corner of Avenida Cabrillo and No. 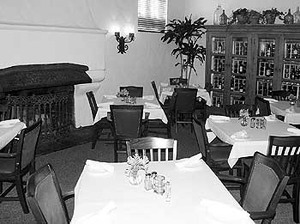 El Camino Real, grab a bite at Travaglini’s Restaurant, spend the night at the old San Clemente Hotel and resume their journey in the morning, often repeating the ritual on their return trip.